Much has happened since the last post, and I’ll try to keep it short, but no promises. Christmas was small and simple this year. My niece, Elli, was old enough to really understand presents and the gift-giving process, so it was fun to watch – it’s hard to believe she’ll be two in a month. The family received a membership to the Children’s Museum, so hopefully we’ll frequent it more often in 2010. The living room is now brown! I’ve been tired of the yellow we painted two years ago; it really never was the right shade. It’s amazing how much it changed the dynamic of the room. It’s now very warm and cozy, and we’ve had several gatherings of people over since then and received numerous compliments. Speaking of gatherings, we hosted the first of many YouTube Parties a few weeks ago. The premise was this: each invited guest was to send in 3 links to videos found on YouTube. Steve put them in a bracket based on the number of viewership hits to battle for the top 4 finalists. The winner: Ukelele Kid. I’m a little upset my entries didn’t advance very far, but the next party is scheduled for March, so we’ll see. We decided to get a Flip UltraHD camcorder, and it’s fantastic. We’ve taken some great footage of racquetball pentathalon, YouTube Party 1, random crazy happenings and of course, the animals. Yes, animals… my newest obsession, other than watching the housing market for fun (no, we’re not really going to move or buy another house. It’s ridiculous to pursue something that grandious. ), is craigslist/pets and petfinder.org. Unfortunately I have found the dog that needs our family. His name is currently Freckles, but I’m not crazy about it, so it’s possible he’ll have an alias. 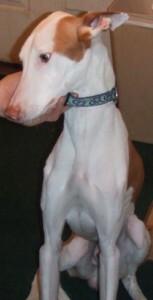 He’s an Ibizan Hound, a fairly rare breed that is similar in body shape and type to a full-sized greyhound. Ironically, his coloring is very similar to – and he pretty much looks like a much larger – Jake. I had to fill out a lengthy 7-page application to adopt this 2-year-old IB before we can even do a meet & greet with Jake. I’m sure they will do fine together, but Kitty… not sure about him. He likes being able to shove Jake into a corner. We’ll see how this goes. I’m beginning to have dreams with Freckles included, so apparently it’s something that has struck a certain heartstring! Joy’s House and CMC are wonderful as always. Our friendships are continuing to grow and mold. I’m loving life right now, and I really can’t wait to see what 2010 shapes into. Next up in February: trip to Chicago with the Flacks and Vincents from Grace + Peace!